LVC ops in F-16 training will only slightly improve the quality of training due to resource and physical limitations. The test in April 2012 had some, but limited value. Wow, the 'ancient' carbon footprint was just that an ancient post. I have a photo from a museum of an A-7 simpit. I'll have to find and post it soonish. Hmmm the sim is not quite what I remembered - perhaps it looks like what Gums refers to in his post? 'viperdriver' so what will LVC be like for the F-35? Spaz! The A-7D sim we had at The Beach was one of those six-axis motion base doofers. No visual outside the cokpit, but was the most advanced sim in USAF at the time. We had huge terrain "plates" that had elevation coded, plus fairly realistic radar depictions of structures, targets, bridges, etc. The two main ones were of Europe and the U.S. A mechanical sensor moved across them according to our plane's position. Very realistic IFR radar presentation. No gees, but the tilt of the cockpit helped to let you know you pulled back or pushed up, etc. All this was in 1972, and we were way ahead of the airliner sims. My point is you can have all the simulation you want, but for A2A you need to feel gees and be able to look around to add to all the cosmic sensors. For A2G, a sim is just fine. Sounds amazing Gums for 1972. That old bird was really ahead of the curve eh. In comparison, the A-7D simulator at Davis-Monthan in 1977 IIRC had no motion base, but did have the early Vital IV visual system (not dome hemispheric) which provided for a somewhat generic runway to takeoff or land on, an air-to-ground bomb circle to practice using the HUD point blank or slew visual aiming or CCIP. Don't remember for sure but I think it was internal computer console scoreable also. You could even strafe and see tracers and sparkly flashes on a strafe target. The specific scene I believe was selected at the instructor console. It also had a cartoonish looking KC-135 with full director lights and you could exercise the A-7 AR system with appropriate ready, contact and disconnect indications on the AR lights. It even had an aircraft carrier to play with. The ground map and TF radar indications, correlated with the PMDS were also excellent on this one, but IIRC the terrain database was US or Pacific theatre oriented at DM. What it did have was a functional G-suit connection, with air, causing the G-suit to inflate when Gs were pulled as well as IIRC the seat cushion to inflate. Wouldn't actually gray you out , but did give a bit of the 'sense' of it artificially in the visual FOV IIRC. In contrast, the F-16 simulator run by HRL at Williams AFB used a hemispheric dome visual projection with an F-16 cockpit just sitting centered in a big room like a planetarium. The digital visual database was fairly detailed & extensive and the presentation was good enough that lack of a motion base was hardly noticeable. It also had an active G-suit connection and G-seat cushion and visual gray out. Then there was the TAC ACES air combat simulator at Luke AFB, with two 556 mod F-4 cockpits, one of which flew like a MiG-21-F-13. It had a black and yellow checkerboard visual background, camera projected moving aircraft models (F-4 & MiG-21) and also the G-suit & G-seat functions. Fights on. One thing they all had in common (less so the F-16 dome) was they could make you actually feel nauseous. Also interesting, Outlaw. Guess they kept the same sim there when I went thru in 1971. Except for visual. The one sim we had at the Beach had full motion, and we even sent a troop thru uncommanded maneuvers for his last seesion before PCS to DM for A-10 cadre. Cranked the levers and beams all the way up and increased all the motions. What a hoot. I can see a great sim for the F-35. Visual stuff is way ahead of what we had in the 80's. Don't care much about all the motion, as other stuff is more important. - map stuff, so the guy can use radar to see and attack stuff. The A-7D sim at the Beach had those 4x 8 maps with altitude and ground stuff encoded. The sensor moved about according to our flight path and we had excellent radar displays, altitude and ground things. - all the data fusion stuff the Stubby is supposed to have. - hopefully, good visual to do things that can't be done using all the cosmic sensors and such. And then there's A2A when in close to a threat. Just to clarify a point made in my cryptic last post above.... I was referring not only to the excellent A-7D of the day but especially to the A-7D simulator 'Gums' described. Jealous 'drool' for those days eh. And for the new F-35 FMS and the rest. As the sims cannot replicate G force, wouldn't it be a good idea to put some sort of high G physiological visualization in place to improve simulator fidelity? In some games, red out and black out were graphically represented by shrinking what's visible graphically based on player input, grey filters, etc. But those models are simplistic. Would it be possible to monitor a pilot's G training in the centrifuge and personalize a G-response chart for each pilot, along with how much effort (quantifying audible breathing and straining) the pilot used to counter the Gs. The sim monitors the pilot's control input and breathing noise, compares it to aircraft performance and pilot performance, and penalizes the sim's video's FOV and quality as appropriate. While we can't affect the pilot's actual vision, we can further increase the impression of dimming vision by playing with coloured cockpit lighting, and brightness and tint of the cockpit displays in conjunction with eventual coloured HMD. And since the F-35's HMD tracks the pilot's head movement, in a fully enclosed sim, the direction of the pilot's eyes can be generalized and the tunnel vision effect can be applied accordingly. Plus there can be visual penalization for having a head orientation inappropriate for the G load the pilot's attempting. In the FMS AFAIK the HMDS is not used with an ersatz gizmo taking over as per the photo. How this affects your theories 'cantaz' I have no idea - I'm just pointing this out. "The Joint Strike Fighter FMS includes a high-fidelity 360-degree visual display system and a reconfigurable cockpit that simulates all three aircraft variants for U.S. and international partner services." "With 40 years in the business, Cubic Global Defense is moving to bring forward the next generation of air combat training with its P5 combat training system. Used by 15 air forces around the world, the system includes a wing-mounted pod and ground-based systems to offer real-time tracking of fighter jets and other assets during training missions. It is also fully integrated into the F-35 Joint Strike Fighter. 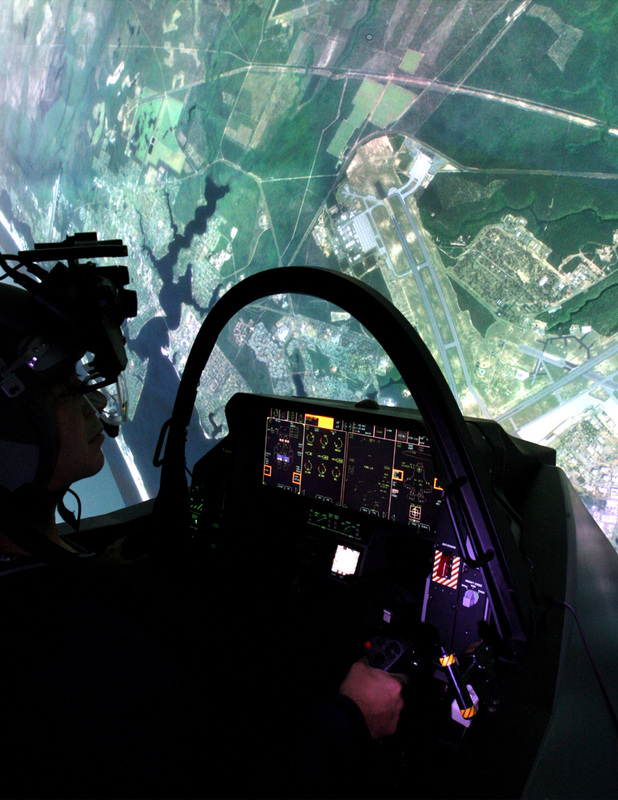 A major step forward with the system is the integration of the virtual environment is another key feature of Cubic’s systems, allowing real aircraft to fly alongside or against simulated threats during training exercises. “Sometimes you don’t have all the aircraft you want to fly the missions, so you could have some guys flying in the simulator, especially if you have low density, high demand aircraft like Growlers or E-2s,” says Waylan Cain, senior programme manager air ranges at Cubic. That integration also offers major cost savings for large scale exercises such as Red Flag, which often involve multiple numbers of aircraft and a “big logistics and sustainment tail,” Cain says. “When you introduce things like the JSF and the F-22 as well, to make it a real scenario to task the airplane to its combat capability, its cost prohibitive to put that much metal in the air,” he adds. Cubic is also able to integrate training systems used by ground forces, allowing for much better training of combat strike support missions." It wouldn't be the same but how about wearing a metallic flight suit in a simulator equipped with electromagnets.? Is this a virtual reality simulator with a 3D headset? Does one lose one's teeth fillings? Electromagnetism ROOLS! spazsinbad wrote: Is this a virtual reality simulator with a 3D headset? Does one lose one's teeth fillings? Electromagnetism ROOLS! LOL... no worries, they get free dental in the military. "The next chapter in naval flight test training is here. The U.S. 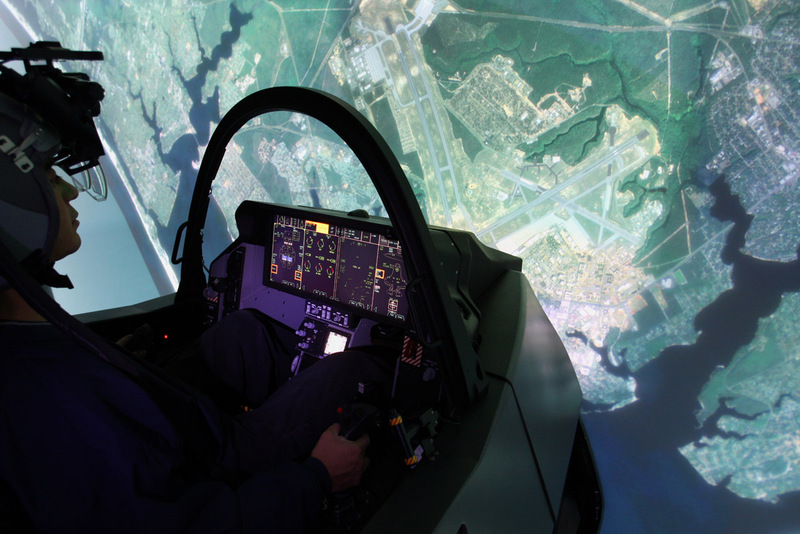 Naval Test Pilot School at Patuxent River, Maryland, recently adopted Live-Virtual-Constructive (LVC) simulation exercise technology into its capstone project for its students. LVC enhances training readiness and prepares pilots for a wide range of operational scenarios, especially ones that can’t be replicated in live training."